One of the very few all you can eat Korean BBQ places I know in the Bay Area. 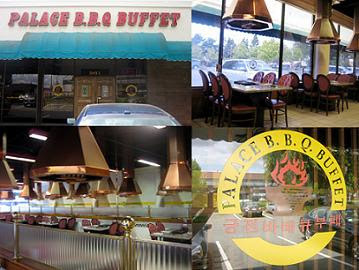 I have been to Palace BBQ Buffet a long time ago for dinner and took some friends there before too. This time we decided to go for lunch because of the dramatic price difference from dinner. Of course that means not as many choices and lower quality meat. 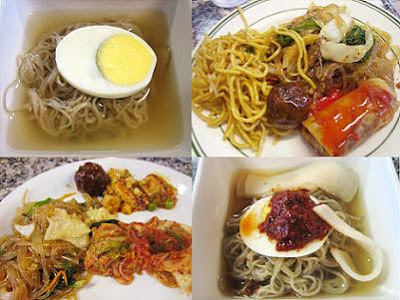 One main meat you miss out if you go for lunch would be the high-end Kal-bi, but you do get the regular kind for lunch. The place was very clean and well ventilated. We were there really early so I got to take a lot of nice pictures, although I bet people who were there thought I was weird. If you go there for lunch or dinner, be sure to go early because they become packed rather quickly. Their lunch price was $12.99, which is a drastic difference from their dinner price. This place has changed from the last time I came, which was a while ago. There were no lettuce, bean paste, garlic, jalapeño for you to grab so Ms. Lin inquired about them. It turned out that you have to purchase those, luckily it was only a dollar extra each person. 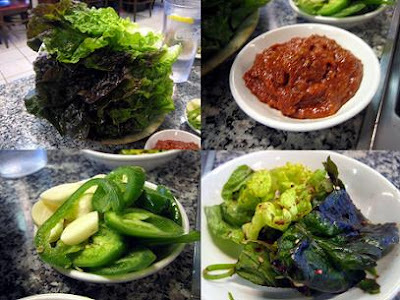 I am not sure if you had to pay extra for the condiments or just for the lettuce. If it was only for the lettuce then I am extremely upset because I blame Ms. Lin for wanting it to wrap the meats. More money for items that are NOT vegetables would be much more acceptable in my mind. Can you tell I am "allergic" to all forms of vegetables? O=9 There was a decent amount of meat to choose from. 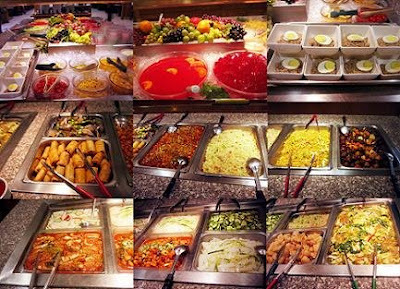 At first we grabbed a bit of everything from the hot bar and the raw bar. The egg rolls were not too bad, they reminded me of Vietnamese egg rolls but not nearly as tasty. They had cold noodle, which was decent but nothing special. Also I think we didn't have much stomach room to finish off the cold noodle after all the meat consumption. The JapChae was decent, although it said "vegetarian" when I saw minced beef in it. I am a meat eater so I don't mind, but I think they should correctly label it so that a confusion can be avoided. Then again, if you are at a Korean BBQ you BETTER be eating meat! 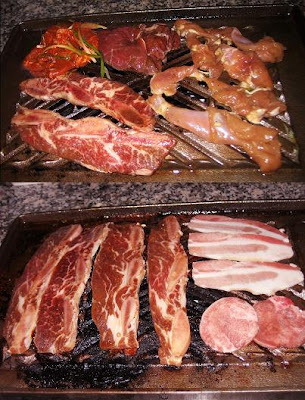 =P Of the meats, I think I still like unflavored meat on the grill and flavor it myself to my own liking. They didn't have that many unflavored meats, except the pork belly. I was not a huge fan of their Bulgogi. The flavors just a little off for me, I don't know if it's because I am used to the taste of Korean food from the OC and LA. It's kind of odd that it was a big enough difference for me to not like it that much. The meat at Brothers in SF doesn't taste any different in flavor than what you get in SoCal. As you can see, I did not like their Bulgogi. The Kal-bi was fine and I actually enjoyed the Spicy Pork. After the first plate of meat that I grabbed, I immediately avoided the Bulgogi and concentrated on the Kal-bi and Pork Belly. The service was decent and I liked that they actually came to change the grill once during the meal. A lot of places get lazy or refuse to change the grills often when it's lunch time. All in all this place was decent. 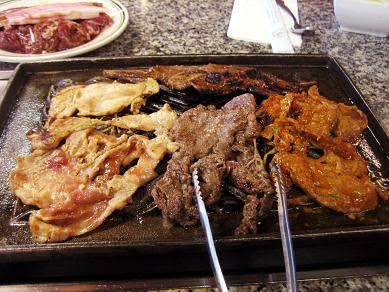 It makes me really miss the yummy Korean BBQs down in SoCal! There's usually more options down there and for a better price. Don't get me wrong, I am still grateful that we can get all you can eat in the Bay Area. Ms. Lin has been wanting Korean food but I have been refusing to go back to Brothers because I'd rather get more bang for the buck. Like I have said before, there are a few things that I am willing to sacrifice quality for quantity because the difference is usually never that great. It's funny how people can change, because not too long before I used to always go to Brothers when I am in the Bay Area. (I have pics from last time that I promise to post later on.) Now you have to drag me kicking and screaming to go back. Well maybe not that dramatic, but it won't be easy.